Well, Summer has arrived without allowing Spring to swish her pretty skirts !! We have had soaring temperatures, with strong dry winds – further desiccating an already tinder-dry environment – Oh Boy !! Bring on the rain !! I had the pleasure, and privilege (together with our Lodge guests at the time) of observing a Lioness, who is solitary (with her 2 young Cubs), use a cunning hunting strategy to hunt an Eland bull. Without the benefit of pride numbers, she has learned to use the terrain as a hunting ally. She stalked, and then chased a small herd of Eland down a steep, rocky hillside, and then singled out one individual (the hapless Bull!) who had taken the trickiest escape route. She chased him into a situation where he lost his footing, and tumbled down a steep slope – probably breaking his back in the fall. We were fortunate enough to be able to follow in the Gameviewer, and managed to re-locate her as she was applying the strangle bite. She did not kill the Eland immediately, but left the area in order to call her 2 Cubs. After some minutes, they arrived and cautiously approached their “meal” – and as they jumped onto it, the Eland gave a strong reactionary kick, which frightened the life out of the 2 Cubs who disappeared in a blur!!!! It shows that Predators, in general, will exploit any advantage in order to secure a meal. Matt had an interesting sighting last week of a rarely seen interaction between a Barn Owl and a pair of Egyptian Geese. The Owl is sharing a Hamerkop’s nest, and the pair of Egyptian Geese were noisily feeding below the nest, and obviously woke the slumbering Owl, who then dropped out of the nest and bombarded the 2 Geese, who then fled in raucous terror!! It’s these special sightings that keep Rangers’ juices flowing!! Sightings of the “pride” of Lions have been fruitful – with the 3 sub-adults growing a-pace, these 3 naughty devils are almost the size of their Mom!! 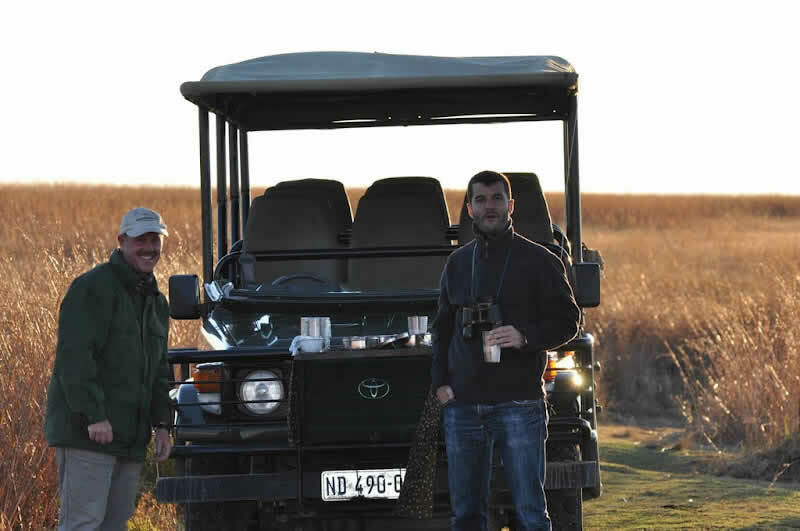 BFE – Nambiti’s legendary Bull Elephant decided to pay his old chums at Umzolozolo a visit. We all enjoyed seeing him stop at the “Elephant Pub “ (ie: the swimming pool!!) for a drink, and then he veered sharply towards the guests dining on the verandah, having caught a whiff of the fresh fruit on the Breakfast Buffet. Needless to say, breakfast was hastily adjourned to the dining room inside, especially as the big fella was in full Musth at the time! !